Artist Fred Harrison at work. The Ontario artist enjoyed his time in Sussex so much, he moved here! 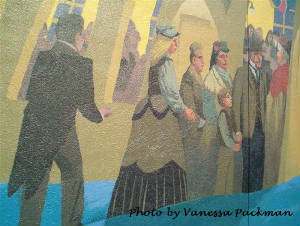 The vivid stories of Sussex are told larger than life in the breathtaking murals that make Sussex the Mural Capital of Atlantic Canada! 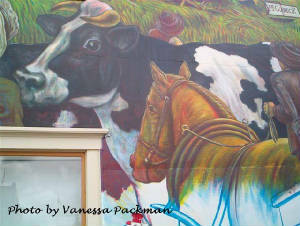 Take a stroll through the Dairytown and Sussex Corner to see why we truly are a Canadian jewel. You're invited to visit this impressive outdoor gallery of 26 larger-than-life images that highlight our military, agricultural, political and sporting achievements. Marvel at the artist's work, and delight in the small touches that make each scene a story on its own. There is no charge to enjoy the murals. Walking guides are available at the following locations to further enhance your tour. Sussex Town Hall; The General Store, 568 Main St, (postcards are also available); Black's Fashions, 607 Main St; Crafter's Vineyard, 614 Main St; Soap Works, 75 Broad St.; Sharp's Drug Store, 3 Broad St.; Visitor Information Centre, Sussex Train Station; and Covered Bridge Inn, 818 Main St.
Three area mural artists were among the international calibre painters instrumental in creating the 26 works that decorate Sussex and Sussex Corner. 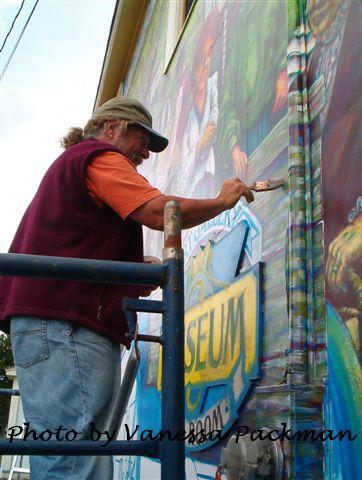 Fred Harrison has been painting for more than 20 years, with his giant scenes adorning streets, homes and public buildings across North America. Andrew Giffin of Roachville (near Sussex) is a multi-talented artist who captured the spirit of Sussex Ginger Ale in his Broad Street scene. Dale Fehr of St. Martins is the creative talent behind the sweet image of maple sugar making that can be seen in downtown Sussex. 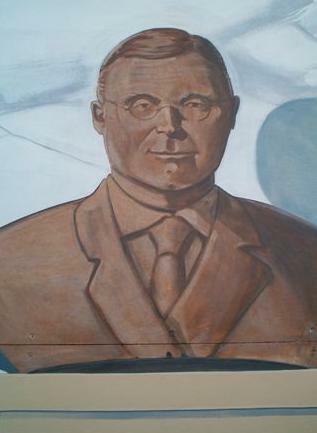 Detail from one of Fred Harrison's 4 murals. Notice the outline sketch of the horse at the bottom. 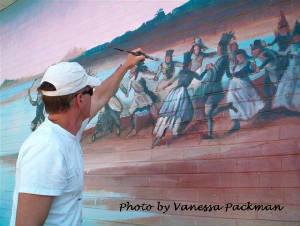 Winnipeg muralist Charlie Johnston works on the details of his Magnolia Avenue mural. Detail of "skating rink" mural by Rudolph Stussi. 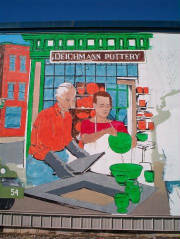 The creation of world-renowned Deichmann pottery has been captured in this Eveleigh Street mural.